Violette Rowell Service Details - Whitby, Ontario | Barnes Memorial Funeral Home Ltd.
Violette was born in Butte, North Dakota. She moved with her parents to Grande Prairie, Alta in 1924 where they homesteaded. She married Stanley Emerson Rowell in 1940. Like so many her age, the war disrupted their lives but in 1944 they settled Chilliwack, B.C. where they fulfilled a dream of Stan’s to own their own business. She worked along her husband’s side until he died suddenly in 1961. Violette sold the business and the family home and began a new life. 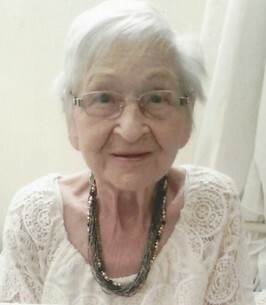 She continued to live in Chilliwack where she found new work at Sears and became part of the Sears family, making many new friends. After the passing of her good friend George, she moved to Whitby in 1992 to join her daughter and start another chapter of her life. Although she missed the mountains and the Pacific Ocean, she loved discovering Ontario and being introduced to live theater, B&B and cottage country. She enjoyed participating in family life. Violette always took great pride in her work and home, loved sewing, gardening,trying new recipes and traveling. She took great pride in her appearance and enjoyed the hunt for a good bargain. She is survived by daughters Carolle and Darlene, Son- in- law Kent, 4 grandchildren-Debbie (Iain), Darcy, Shannon (Shawn) and Tyrone (Lauren), great grandchildren Alison, Robert, Sam, Isabel, Charlotte and Liam and many cousins from the Balisky family. Violette was predeceased by an infant sister, husband and granddaughter Cindy. Great appreciation to the staff at Fairview Lodge who so thoughtfully cared for Violette in her last days. Thanks to Dr. Eapen who cared for her for many years. We encourage you to share any memorable photos or stories about Violette. All tributes placed on and purchased through this memorial website will remain on in perpetuity for future generations. Dear Darlene and Kent, I was very saddened to hear of Violette's passing. She was 'one of a kind'. We always looked forward to her appointments at the dental office. Violette always had an interesting story to tell, and made us laugh. She lived a full life, and was very proud of her family. My sincere condolences, Avi Wurman.